(CORPUS CHRISTI, Texas)—From Missouri to Texas, the road of agriculture led Garren and Shannon Bellis to the Lone Star State, and their efforts in agriculture have been rewarded. They’re the winners of this year’s Texas Farm Bureau (TFB) Excellence in Agriculture competition. Garren manages Gabriel Ranch in Grand Saline, which is a registered Angus seedstock operation for both commercial and purebred cattlemen. Five generations of Garren’s family raised cattle, and three of those generations were focused on Angus. So, it was only natural for Garren to find a job that combined his family’s history and passion. At the ranch, Garren oversees the annual female and bull production sales, nutrition and health protocols and handles the daily aspects of the operation. Shannon manages BovaTrac International, a company that focuses on genetics for the commercial cattleman. Shannon started the company with her dad. The goal is to work with cattlemen and women across the globe, helping improve the efficiency and profitability of their herds while optimizing the resources they have available. Through BovaTrac International, Shannon has worked with international groups and serves as a cattle consultant to the Ministry of Agriculture in Israel. The couple also raises cattle of their own and hopes to grow their herd in the future. For Garren and Shannon, there is nothing better than raising a family in agriculture. They have one son, Beau, and another, Kaeden, on the way. The couple also participates in Farm Bureau activities on the county and state level. As winners of the Excellence in Agriculture contest, the couple will represent Texas at the national competition in January. They’ll also receive a side-by-side UTV, courtesy of Southern Farm Bureau Life Insurance Company, and a $5,000 cash award, courtesy of Farm Credit. Other finalists in this year’s competition include Ryan and Jessica Railsback of Cisco and Ardy Tiner of Rusk. The winner of the national Excellence in Agriculture award will receive a $35,000 credit toward a Ford truck, courtesy of Ford Motor Company. The third and fourth national finalists will receive a combination roll cabinet and top chest and a $500 Case IH parts card, courtesy of Case IH. 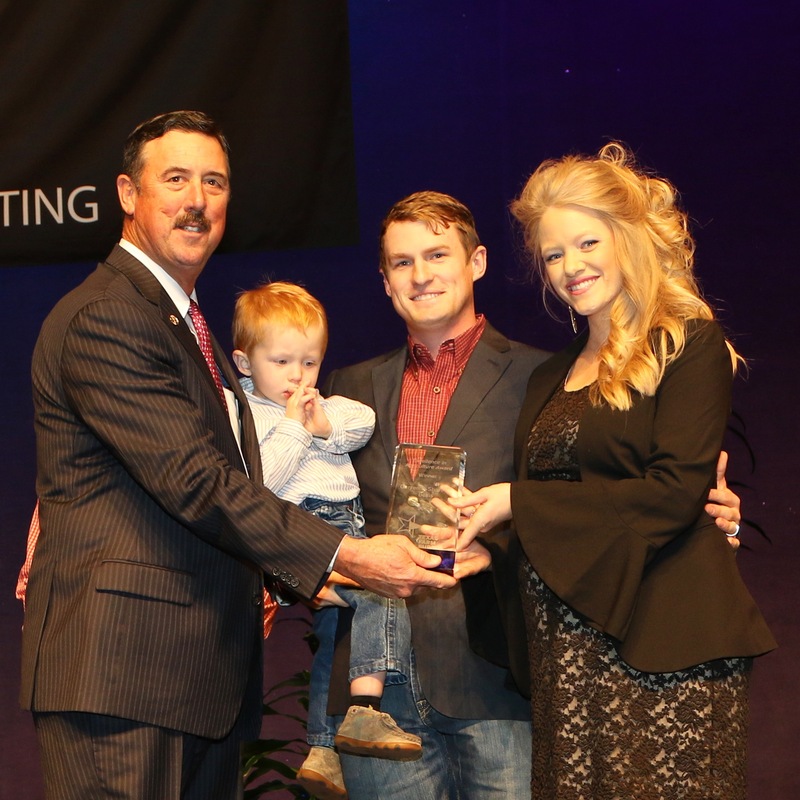 Garren and Shannon Bellis of Grand Saline are the winners of the 2018 Texas Farm Bureau Excellence in Agriculture contest at the organization’s 85th annual meeting in Corpus Christi.